Review: Makeup, mystery, and a hint of romance: don't you love all of these in a book? I sure do! I So Don't Do Makeup brings you back to Sherlock "Sherry" Holmes Baldwin as she takes you on an adventure to uncover... makeup? I So Don't do Makeup is third in the phenomenal series, following I So Don't Do Mysteries and I So Don't Do Spooky. This awesome mystery series is by Barrie Summy. When Sherry has a sleepover with all her best buds, she doesn't think anything can go wrong! Even with her health-food addict stepmom "The Ruler" (her real mom was a cop that got killed, and so now Sherry's mom is a ghost works for the Academy of Spirits!) watching Sherry and her friends Junie, Brianna, and Kim, Sherry can't think of a better sleepover! She's got it all under control- pizza, then makeovers! Part of the makeover includes Nite Sprite Face Cream to leave on overnight. Unfortunately, Kim (who is Sherry's boyfriend's cousin) is part of the Janes, an unusual group at school who reject makeup. Early in the morning, Sherry, Brianna and Junie are awakened by a strange burning sensation on their faces. They all run to the bathroom to wash it off, and notice the red, dry, and scaly skin on their faces. Sherry and Brianna scream, and the Ruler comes running up the stairs to come to their aid. After a small amount of time, Sherry goes to the mall in search of Amber, who helps run the new mall kiosk, Naked Makeup, which is where the night cream is from. When they get there, Amber's manager Lacey gives them makeovers to hide their faces. All of a sudden, Sherry's boyfriend Josh calls. As they get more and more wrapped up in the Makeup Mystery (and more things get contaminated like lip gloss, hair cream, and other things) Sherry gets to spend Real Time with her mom (she can actually see her)as they solve the mystery and catch the culprit together. I absolutely love this book. I hadn't read the first two books, I So Don't Do Mysteries and I So Don't Do Spooky, but I didn't need to because the author gives you all the information that you would need to understand from the first books, like who all of her friends are, and about her mom. I also like the characters, and how I could relate to them because they are about my age. Also, I really like the storyline, because the culprit is someone I would have never suspected. I like how her mom still lives on, and her grandpa too as a bird. This book sucked me in (as every great book should), and I could barely put it down! I like how the author didn't try to do the whole evil stepmother thing, too because I thought it wouldn't have been as good if she had. I recommend this book for people of all ages, even boys! It is one of the best books I have read in a while. All in all, I So Don't Do Makeup is definitely a five out of five on my book list! We would like to thank Random House for providing a copy of I So Don't Do Makeup for this review. 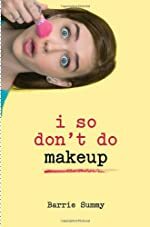 Have you read I So Don't Do Makeup? How would you rate it?